"Keep Your Snowcat Operators SAFE with the Most Effective Snowcat Training"
Our instructors at Safety One are personally committed to provide the best fall protection training to keep your employees safe at height. Our courses combine the in-depth knowledge, hands-on practice, and real-case simulation training to help students in every field deal with their unique situation. 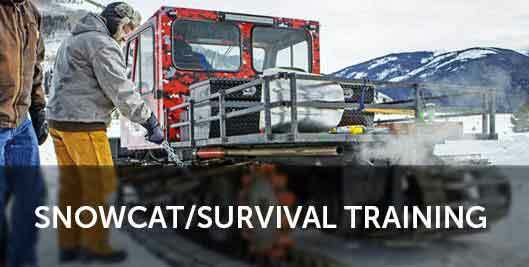 Our Snowcat Training focuses on safety and survival techniques, specialized equipment training, and snowcat repair under emergency conditions. So that in a real-life crisis our students are prepared to handle the predicament and return with the vehicle and crew safely. Whether you are performing tower maintenance or on a rescue mission, you need specialized fall protection equipment to keep you safe. Safety One does not endorse a specific line of products, instead, we handpicked the top-rated products to provide the perfect solution for different safety needs. From Fortune 500 corporations to local businesses, companies trust Safety One to train their employees at height and in extreme conditions. Protecting your staff is as important to you, as it is to us. For us, “safety” is simply the beginning of the relationship – From training to our 24/7 support, our trainers/staff at Safety One are deeply commitment to providing premium fall protection training and snowcat training, and functioning as your partners.